Today I want to write about beluga whales because they are a very cool and beautiful species of whale. Beluga whales are the smallest species of whale, but males can still grow up to 5.5 metres long and weigh up to 1,600 kilograms, which is still pretty big. They are found in large groups of up to several hundred in the ice cold arctic waters of northern Russia, North America, Greenland and Norway. To protect themselves from the cold, they have a layer of blubber that is 15 centimetres thick. Every summer, large numbers of beluga whales gather in shallow waters to shed their skin. They rub themselves on gravel to remove the old yellow skin and reveal a new shiny white coat underneath. Beluga whales can live for a very long time, with some scientists estimating that they can live for up to 50 years. Are there any other interesting facts that you would like to share about beluga whales? 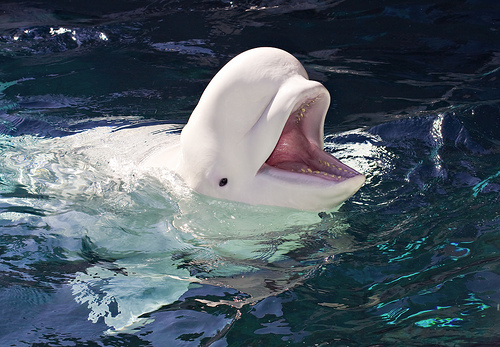 I love Beluga Whales!I think they are really pretty and kind of like dophins which I also like a lot. Cool blog!